I grew up eating Indian food. It was a common take-out night alternative to Chinese food or pizza nights. And because it is ingrained in my food psyche, I often crave it as a 'comfort food' above just about anything else. If I'm feeling down, naan will certainly cheer me up. 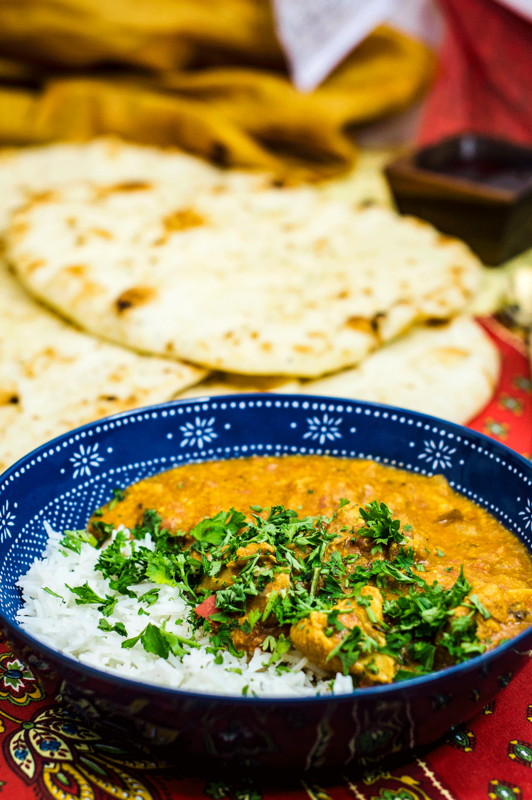 That's how this chicken korma came around - I was seriously craving some good Indian food and unfortunately live pretty far away from the only Indian food restaurants. As much as I love Indian food, I have a hard time justifying driving an hour through a snow storm to get some for myself. 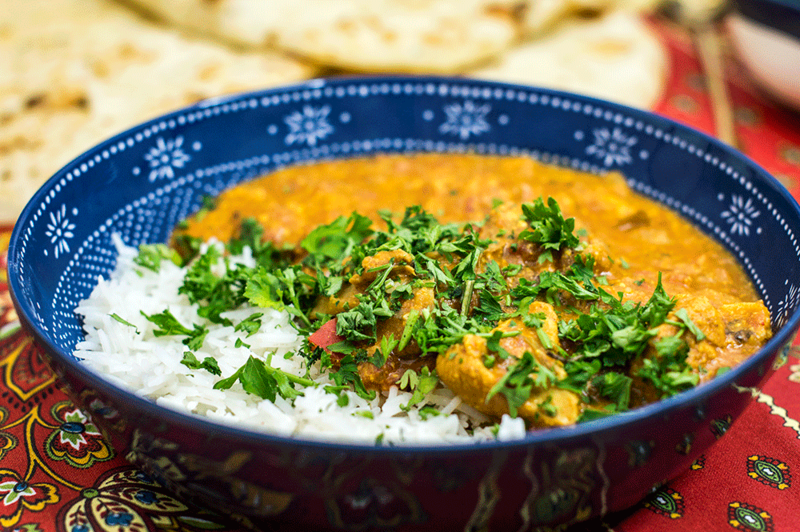 In such instances, I'm glad that I am able to recreate my favorite dishes with relative ease - and having an Instant Pot just made making Indian foods, that generally take hours to prepare or marinate, easier than ever. Start with your Instant Pot on "saute" normal mode. 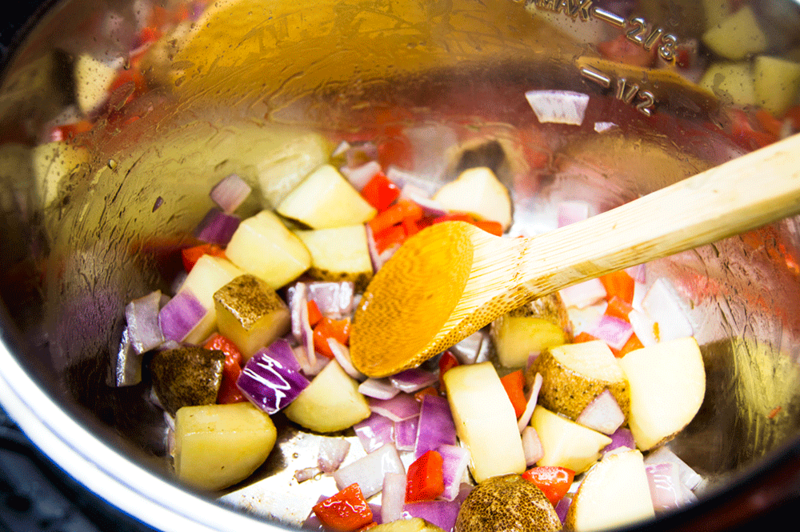 You just want to get the potatoes, onions, and peppers softened slightly - it'll make them cook more evenly when under pressure. Next, add in all the herbs and spices. I used an extremely spicy sambal olek - or chili paste - and a hot red curry paste for the base of my korma. I also used an array of Indian spices like cardamom, cumin seeds, yellow curry powder and garam masala. Once the spices are fragrant, it's time to add the broth and chicken. I let my chicken sear for a minute or two to get some color, but that part is totally optional. 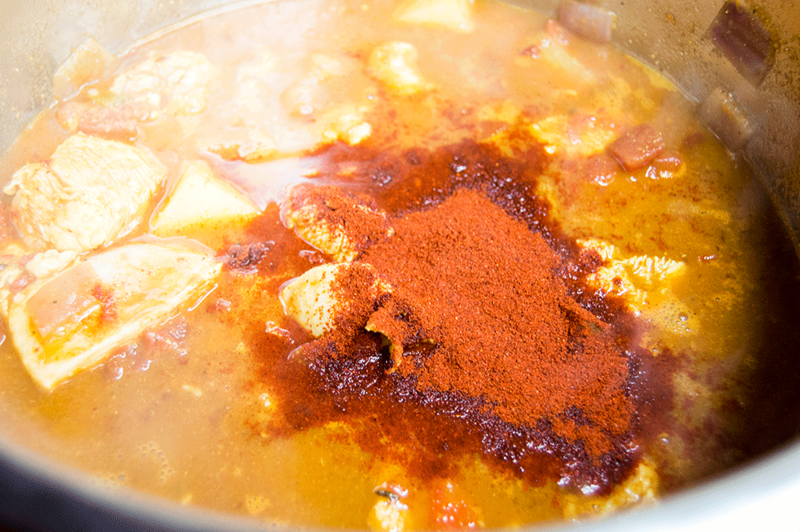 Some spices, like paprika, can be added after the broth for both color and flavor. 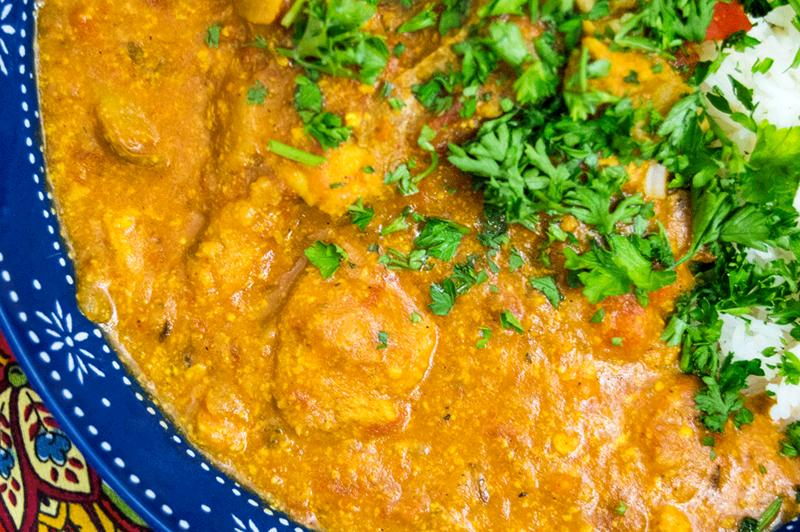 I was going for a reddish orange color for my korma, but there are yellow variations as well - now is the time to adjust the flavors to your liking! Bring the contents of the Instant Pot to a rolling bubble. When the oils begin to separate you'll know it's time to put the pressure on! Cancel the "saute" mode and put on the Instant Pot lid. Set the Instant Pot to "Pressure Cook" on high for seven minutes. When you remove the lid, be prepared to be smacked in the face with the best fragrances on Earth. 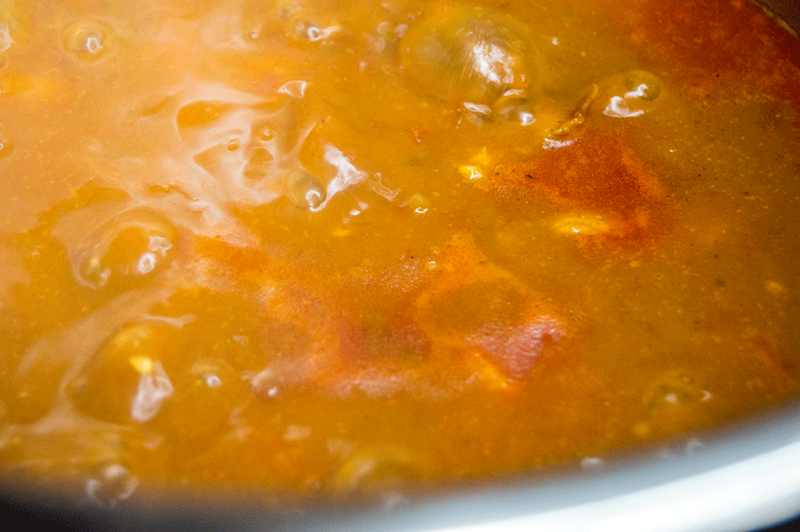 If you like a thicker curry, you can let it simmer on "saute" mode for another 5-10 minutes. Just stir in the Greek yogurt and serve with some homemade naan. I made enough to have leftovers for the week - it was my favorite meal prep lunch yet! Turn the Instant Pot on to "saute" mode - press the "saute" button until it light indicates "high" or "more." 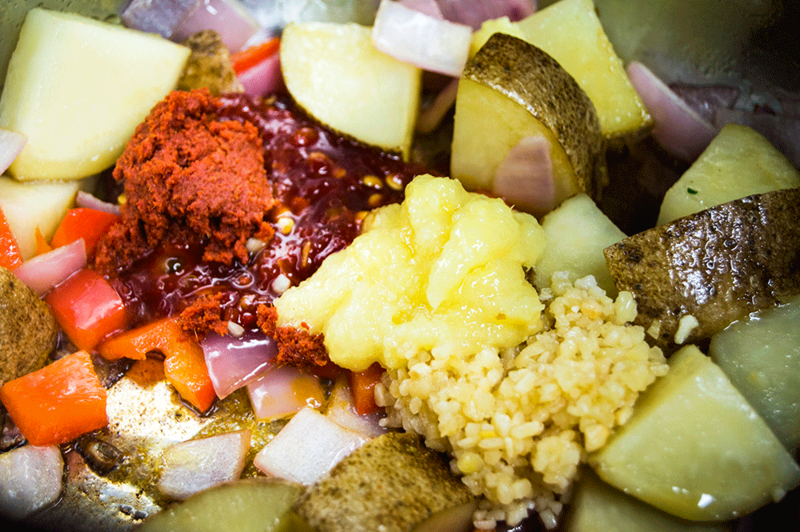 Add the ghee and while it melts, chop up the potato, onion and red pepper. Add the potatoes to the IP and saute until browned, stirring occasionally for about 10 minutes, then add the onion and red pepper. Stir in the garlic and ginger. Saute until softened, about 5 minutes. Season with salt and pepper, to taste. Add the canned tomato to the IP. Stir all the spices and pastes into the vegetable mixture. Heat until fragrant, about 2-3 minutes, then add the chunks of chicken. Let the chicken brown on one side, as desired, or skip to the next step. Pour in the chicken broth. 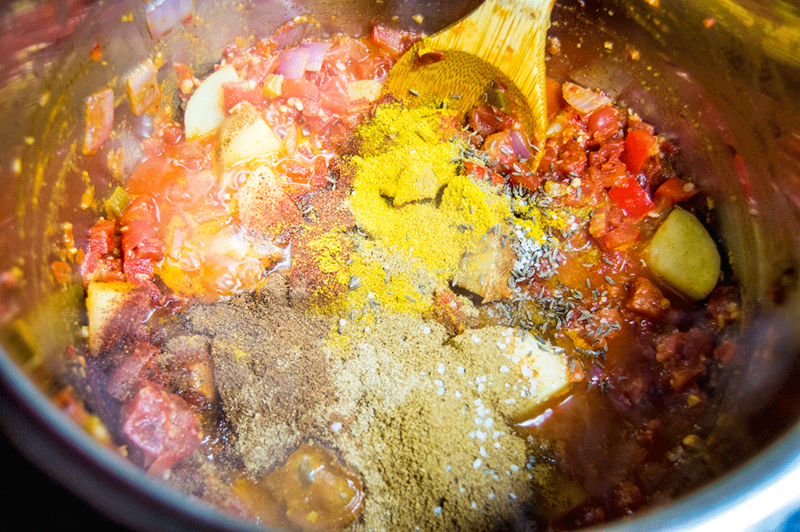 Add more paprika or turmeric to achieve the color you want, as desired (I added more paprika for a reddish korma). Season with salt and pepper. Bring to a rolling bubble on "saute" mode. When the oils begin to separate, after about 5 minutes of bubbling, cancel the "saute" mode. Secure the lid on the IP. Press the "Pressure Cook" button so it is on the "high" or "more" setting. Turn the valve to "sealing." Set the timer to 7 minutes. Let the IP pressurize. Cook the naan and basmanti rice, if serving, while the IP pressurizes over about fifteen minutes. Let the IP depressurize naturally or do a VERY CAREFUL quick release by adjusting the valve from "sealing" to "venting" - be sure to wear an oven mitt or similar heat protection!! Remove the IP lid. Spoon about a half cup of the korma mixture into a bowl with the Greek yogurt and stir well to combine. Don't add the yogurt directly to the IP or else it may curdle and separate. It's okay if it does this, but it creates a thicker korma if it doesn't! 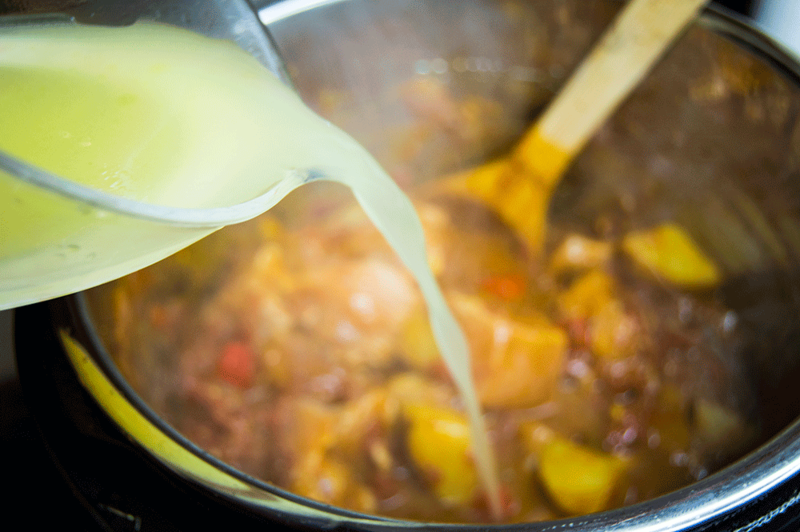 Simmer the korma on saute mode to thicken up, as needed. Serve the korma hot. Garnish with cilantro or parsley, serve alongside a bed of basmantic and several stacks of naan. Enjoy!